As you review the benefits of Shading Your World, we are sure you will conclude that Shade Your World Inc offers the best products and the best value. Additionally, and most importantly to us, the greatest benefit to you is our assurance of CUSTOMER SATISFACTION! From the presentation, to the product, to the installation, to any necessary service, all of us at Shade Your World are totally dedicated to your absolute satisfaction. You deserve it, and we will earn it! • Our awnings are custom made to meet your needs. Your awning can project to any length, up to 14 feet, 8 inches. It can be as wide as you would like. 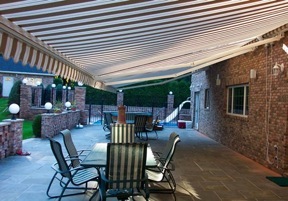 • Shade Your World offers the most attractive and strongest awnings on the market today. All the structural components are constructed of solid steel. • To withstand Missouri's heavy wind gusts, our line of awnings are wind load tested from 35 mph for the economy model, up to 40 mph for our stronger awnings. • Through TUV testing, our arms have been tested up to 60,000 cycles without failure, equivalent to using your awning twice a day for 82 years. • Each arm is individually tested for proper spring tension. Our strongest awning arm has over 1800 lbs of spring tension. • All the metal parts of the awning are electro-static powder coated and warranted against rusting, chipping, and peeling. • All the nuts, bolts, and screws we use are made from the finest corrosion resistant stainless steel. 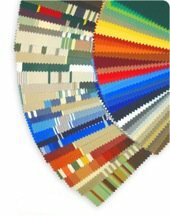 • Our fabric is 100% Acrylic material which is stronger and more weather resistant than canvas or vinyl. All materials are treated with a fabric protector to prevent sun spotting and sun fading. 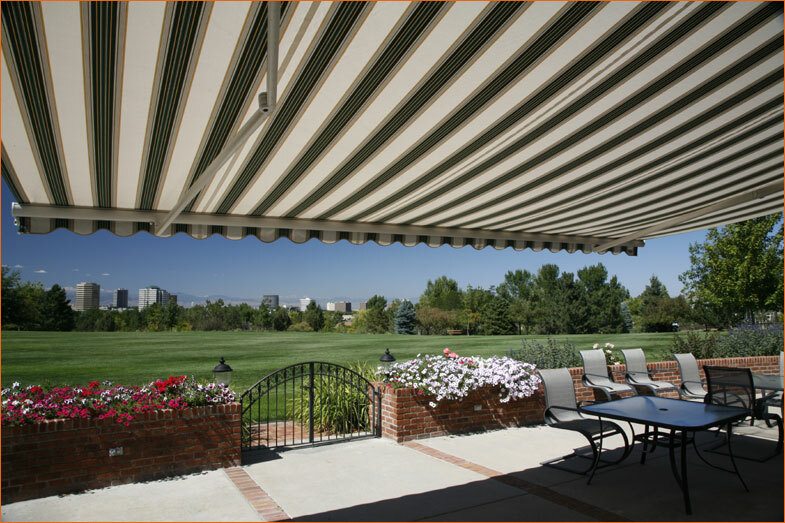 • The slope of your awning has a wide range of adjustment (0 to 45 degrees) to shade a greater area. • We highly recommend a Motion (Wind) Sensor which is nearly full-proof protection against awning damage by high winds. Copyright © 2008-2017 Shade Your World Inc All rights reserved.